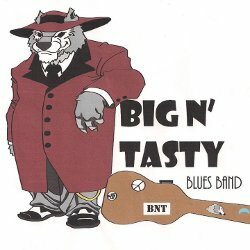 Big N Tasty Blues is ready to take a break from the cold and make their way down to Memphis for the 31st Annual International Blues Challenge. The seven member blues band from Green Bay, Wisconsin has formed their own style like none other around the area. Each member comes from a different musical background as well as age background, allowing the band to become a blend of different styles. Blues isn’t something that gets a lot of publicity in the Green Bay area and it makes the market for it hard for the band. After traveling to Grafton to compete for the Wisconsin representative, Big N Tasty walked away with the 2014 Grafton Blues Challenge People’s Choice Award and the 2014 Grafton Blues Challenge 1st place Award which led to a competition spot at the 31st Annual International Blues Challenge. In a town of mostly 80’s rock and country music, Big N Tasty has successfully been able to prove that they are passionate about what they do. “You know you’ve got it right if you feel it. You don’t have to look, you don’t have to think, it just happens. That’s how I feel with all music, if you play it from your heart and really play it, it just happens. You can’t make a mistake, it just happens,” said harp player Brad Skenandore. The International Blues Challenge is a five-day event including solo/due completion as well as band competition. On average 250 acts from 40 states and two dozen countries compete. Big N Tasty will be the only band from Wisconsin looking to compete for first place. Winning isn’t everything for the band, however. They are also trying to bridge the gap between generations and ideas about blues. Older generations understand the blues and grew up around it while today’s generation isn’t as aware of the greats like B.B. King, Albert King, Stevie Ray Vaughn, and so on. Even rock guitarists like Jimi Hendrix and Jimmy Page use the blues in their playing. The band tries to take those styles and mix them all into something that audiences from all generations can understand and appreciate. Big N Tasty leaves Saturday January 17th for the IBC. The band hopes to return with gained knowledge, awards and further appreciation for the blues and those who participate in it. The band will be returning home to work on a new album in 2015.